It is your perfect companion for board games, sport workouts, cooking, zen meditation or whatever activity that needs a precision and powerful timer. Timer allows to define multiple special events that will be triggered when the timer is running. Sounds, messages, photos, screen flashing and more actions can be triggered at any time thanks to a complex time scheduling system (that can be easily previewed). 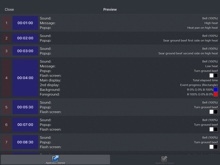 The majority of these actions can be done when the application is open, but it is still possible to play sounds and display messages when the application is closed. 9 complex timers with time scheduled events can be used at the same time. 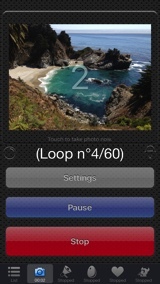 The timer can be looped forever or for a specific number (the number of loops being displayed). Elapsed time, remaining time, current time can be either displayed. Various display modes are available (including textual or graphical ones). The time is displayed in full screen, in the biggest possible way. Two different areas can be customized. The timer start can be delayed, allowing to have a short preparation time before the timer is automatically started. The stop time can be entered as a relative duration or as an absolute hour value. 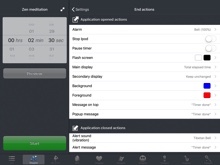 Portrait and Landscape visualization modes are handled in all application screens. The timer can be used when silence is needed (thanks to a flashing screen, vibrations and a dimmed display). When the timer is done, the time is still displayed, allowing to know since how long the timer elapsed. 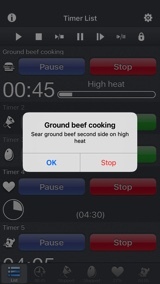 The screen can be blocked, keeping the timer visible, in order to avoid pressing accidentally the buttons. Shepard tones can also be used : those tones creates the auditory illusion of a tone that continually ascends or descends in pitch. Import custom sounds or record them directly. Use them as audio alerts when the application is opened. Play a random iPod song. 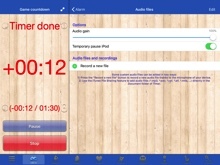 Custom musics/sounds can be selected from the iPod library to be used as internal alarms. The iPod music can also be stopped. Automatically take pictures at given times. Use the flashlight as a visual alert. Load, save, import and export your settings, allowing you to share and have multiple configurations ready to be used. 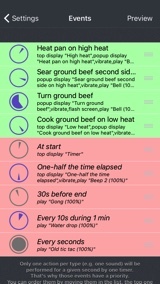 Customize the look of each timer to your taste. Q : Can you explain how to use the application ? 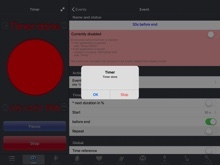 In Timer you can create 5 (or more) different timers, and use them independently. To switch from one Timer to another, use the tab bar located at the bottom of the screen. The first tab bar item is not a Timer, it is a special screen that lists all the Timers, and allows to start/stop/pause/resume/toggle them at the same time, and gives you access to some general settings (top right gear button). Once a Timer screen is selected, you can start/stop/pause it and you can also define precisely the way it will behave. 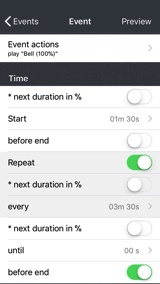 To configure a Timer, you first have to define the total time of your routine. Defining this total time is the basic definition of Timer, you do it using the time picker of this main screen. Once your total duration time has been set, you might want to define what will happen once this time will be elapsed. 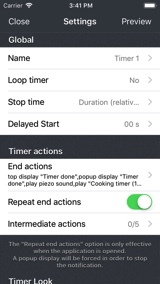 Press the Settings button in the main timer screen to configure this Timer behavior. Under the Timer actions section, you can find the End actions item (which displays a short preview of its content). Select it to change the end actions of the Timer. When the End actions item is selected, the following screen is displayed. From here, you can select and define the different actions that will be performed. Most generally, you'll only want to have a sound played or a message displayed. But as you can see, you can do more than that (change the colors of the screen, flash the screen, change the look of the time widgets displayed on the screen). At any time in the application, you can press the preview button (either located in the main screen, or at the top right part of most of the screens). This preview screen can list all the actions defined by your timer configuration, and the time when they will occur. Touching a list item in this preview, will trigger most of the associated actions (which can be useful to hear the associated audio volume, for instance). The bottom tab bar allows to choose to preview the Application Opened or the Application Closed actions. In this screenshot, the most simple configuration is displayed : the actions that will occur at the end of the time. Go back to the main screen, pressing all the top left back/close buttons. You can now press the start button to start your timer. The settings can still be changed, even if the timer is running. It is also possible to pause, resume and stop the timer. You can touch the time areas to change the way they are displayed (this can also be changed under the Timer actions section of the Settings screen). A lock button can be pressed to avoid any unintentional changes, while the timer is running. Please, note that the application supports also landscape orientation, which allows bigger things to be displayed. 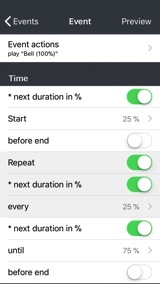 Under the Timer actions section, you can decide to repeat the end action (every 5 seconds). This way you will hardly miss your audio notifications. You can also define some Intermediate actions : this is the most powerful feature of Timer, but we'll talk about it later. Under the Timer look section, you can change the look of the Timer. The main things to change are the main and secondary displays : this will change the way the time is displayed when the timer is running (like having the time displayed as digits or as a progress bar). Timer allows you to define some highly more complex time configurations, defining some Intermediate actions (located under the Timer actions of the Settings screens). Those intermediate actions are quite similar to the end actions, but they can be triggered at various time events, while the timer is running. You can add as many time events (with associated intermediate actions) as you want. You should look at the 4 (disabled, by default) sample events, to see how they are defined. That should help you to create your own. Once an event is created or selected, you can configure it. the Name and status section, helps you to identify your event, to enable or disable it, and to quickly see how it is defined, in a human readible way. Don't forget that you can also press the preview button to see the impacts of your changed event to the total timer configuration. the Action section, is similar to the end action you already know. the Time section, allows to define when the actions of this event will occur. This time definition is relative to the start or the end of the timer. It can be defined in seconds or in percents (of the total duration of the timer) for a great flexibility. You can also make the action repeat several times, if needed. You can check the Configuring Events part of the FAQ in this web site to see some examples of time definitions. 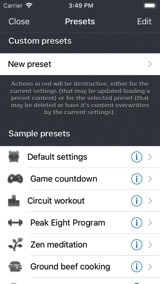 In the Settings screen of each Timer, you have access to a Presets button located at the bottom. Pressing it will display the presets screen. 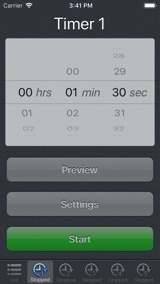 In this sceeen, you can save/load/preview/export a timer configuration. Some samples are included so you can load them and have an idea of some different things you can do with Timer. Q : What is the URL scheme supported by Timer? One or several actions can be added to this scheme, as the query parameters. Here are the different actions. They take, as values, a coma separated list of screens (represented by their position in the tab bar of Timer). show : shows the specified screen. 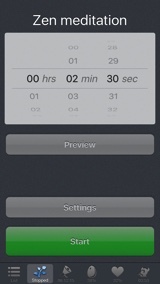 start : starts the timer(s) in the specified screen(s). stop : stops the timer(s) in the specified screen(s). startstop : toggles the start/stop state of the timer(s) in the specified screen(s). resume : resumes the timer(s) in the specified screen(s). 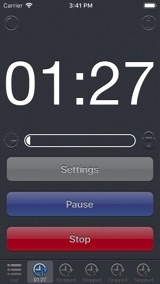 pause : pauses the timer(s) in the specified screen(s). resumepause : toggles the resume/pause state of the timer(s) in the specified screen(s). lock : locks the specified screen(s). 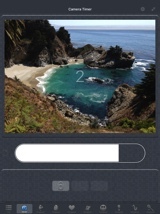 unlock : unlocks the specified screen(s). The x-success parameter from the x-callback-url protocol can be used to go back to the source app. x-success : the (callback) url to open once all the actions are done. timer://?resumepause=1 : Open Timer and pause (or resume) the first timer. timer://?show=0 : Open Timer and show the list screen. timer://?start=1,2&x-success=http%3A%2F%2Fpacolabs.com%2FiOS%2FTimer%2F%23Help : Open Timer, start timers 1 and 2 and goes to safari. 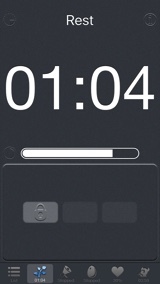 timer://?stop=0&show=1&start=1&lock=1 : Stop all the timers, show timer 1, start it and lock the screen. Q : No alam sound is playing on my device when the application is opened. What's the problem? Be sure that the volume is not too low (using the hardware volume button). According to your device settings, (in the General->Sounds screen of the Device Settings application), the volume buttons might not be active for the alerts, you can then change the volume in this dedicated screen. Q : No alam sound is playing on my device when the application is closed. What's the problem? You have probably muted the audio alerts using the hardware side switch button on your device, try to toggle it. According to your device settings (in the General->Side Switch section of the Device Settings application), this hardware button might be dedicated to the rotation lock. You can then access to the mute audio onscreen button double clicking on the device home button and swiping the displayed bottom bar to the right. Q : I cannot receive notification when the application is closed. What's the problem ? On iOS5 if you are not receiving notifications, when Timer is in background, check the parameters of the new Notification page of the Device Settings Apple application (Settings App -> Notifications -> Timer). Q : I am unable to find a way to save custom presets. What am I missing on this? If you want to save the current configuration (everything defined in the settings screen) you have to press the "Presets" button and then the "New preset" list item. Give a name to your preset and press the done button (or the "Presets" top left back button). Your current configuration is now saved to this newly created preset. If you want to load a preset, and then change the current configuration to the one previously saved in a preset, press the "Presets" button and select the name of the preset you want to load. Press "Load" to confirm that you really want to load this preset (which will change the current settings of Timer). (Before loading the preset, you can preview it, pressing the blue arrow located to the right (after the preset name), or selecting the preview option). If you make a change to the current Settings, it won't affect the preset you may have selected to initialize those settings. To save those changes you will then have to edit and replace the content of your preset. Q : How can I add my own sounds? 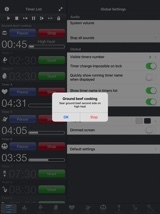 You can add your own sounds to be used as an alarm when the application is used in foreground. You have to use iTunes to import those sounds. Here is more information on how to use iTunes Files Sharing in order to add your audio files to the folder associated to the Timer app. First, you have to set a global Timer duration on the big time picker. Set it, for instance to 1 hour. in the Settings, under the "While The Timer is active" section, press the "Events" item to show the events screen. in the Event screen, select the audio alarm you want (for both internal and external notifications) and focus on the Time section. Your configuration should be set like the one in the following screenshot to trigger the notification of this event every 10 seconds. You can press the preview button (second screenshot)to see if your definition will behave as expected. Q : Am trying to set up a 75%, 50%, and 25% alarm event. How should I set up the event to achieve this? You need a single event to perform those notifications. The following screenshot displays the time definition for that. The second screenshot displays the preview of this event for a 20 minutes timer duration. Q : I want to divide a set amount of time (say 20 minutes) into alternating events of 1.5 and 2 minutes. Would you please help me? To perform those alternating '1 minute 30 seconds' and '2 minutes' events, you have to think of a global repeating time pattern of '3 minutes 30 seconds'. You can create 2 events, as defined in the following time definitions. You'll then get the notifications displayed in the third screenshot. Q : I have created a timer that pops up a message 5 seconds after the start and 20 seconds before the end. Is there away to have the message disappear after a few seconds rather than having to hit OK? Messages in popups always need a confirmation. Adaptations to iOS 11 and iPhone X. Ability to give and display a title for each timer. Fixes some problems with custom keyboards, where text entry is necessary. 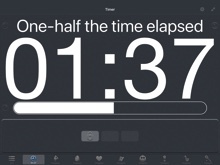 Timer was one of the first application of the AppStore, and today, 8 years later, a new 18th version is released. Premium features are now accessible to anyone. No more in-app purchase. New Icon (and small changes in the interface). iPad Pro and iPhone 7 plus support. Sounds - New: Addition of 6 sounds (2 to 7 consecutive beeps). Those sounds can be used when the application is closed. Main - Bugfix: On iOS 7, fixes the display of a different message when a popup was already displayed which was causing the popup automatic removal, making the touch screen inactive. 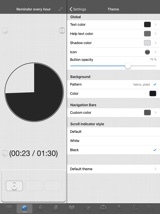 Main - Bugfix: On iOS 7, Fixes the "pause" text too small in landscape mode. Main - Bugfix: When exporting the timer preview by email, the secondary display mode is now correctly displayed. Global: Fixes a potential bug in the 5.1 version startup. Global: As requested by Apple : replace the unlock mechanism (which is forbidden to use) by a button based one (a slide gesture can still be performed to press the 3 buttons). 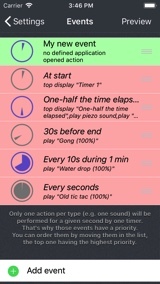 Action - New: "pause timer" action, to automatically pause the timer at a specific time. 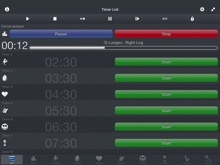 Display - Change: Increased main time display area on iPad and iPhone5. Display - New: Big rectangle shaped progress bar, as main display mode. Display - Bugfix: Avoid the message on top to change once the timer is elapsed. Sounds-iPod - Bugfix: Improved iPod songs save/restore. Sounds-iPod - New: For premium users, "Random iPod music in playlist" alarm action to play a random music in a specified playlist. Presets - New: For premium users, the configuration is now also displayed in plain text in the export mail of a preset. 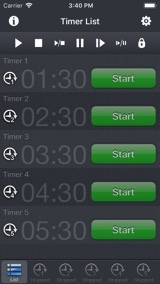 New : Several timers (3 for all users, up to 9 for premium users) can be used at the same time. New : A new screen can be selected to display/start/stop/pause/resume/toggle all the timers at the same time. 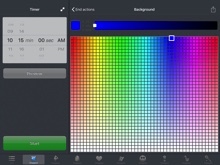 New : New animated tab layout allowing to quickly select a timer. Main - Change : Bigger Start/Stop buttons for iPhone 5 of iPad users. Main - Change : The 5 seconds minimum duration limit has been removed. Main - Change : The presets button is moved from the main timer screen to the settings screen of this timer. Main - Change : When the screen is dimmed, it is now possible to touch anywhere to temporary remove the dimming (this feature is optional). Theme - New : For premium users, it is possible to change the icon of the timers. Theme - New : For premium users, it is possible to change the opacity of the buttons. Presets - New : For premium users, icon support in the preset list, and new Peak Eight preset. Sounds - New : For premium users, add m4r file support. This 4.0 update of Timer brings more power to your time schedules, adding several new features and making them easier to use. iOS5.0 slightly changed the way of handling applications when the device is locked (degrading some previous functionality, but improving the battery usage). For this reason, in this new version of Timer, when the device is locked manually (using the hardware button on top), only the background notifications will occur. Those notification are the ones that were already defined for when the application is closed. As explained in Timer, they can trigger text display (in banners or popups) and they can produce predefined sounds and vibrations. Main - New : Retina display support on the New iPad. Main - New : Slightly new icon, new startup image, new look of the application (to something more elegant and singular), changes in the organisation of the settings. Main - New : It was already possible to loop the timer forever. 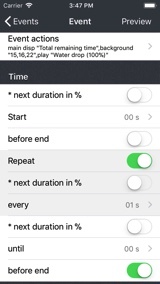 Now you can also set the timer to loop for a specific number of times only. Main - New : The preview screen is not restricted to the first loop anymore. All loops are displayed. Main - New : Improved clone event feature allowing to quickly clone several instances of an event, assigning different starting time to them. Main - Change : Easier way to repeat the end notification. The option is always visible in settings. 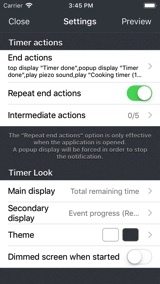 In case repeat is set to ON, a popup will always be displayed at the end of the Timer (to give the possibility to stop the repeating notification without stopping the Timer). Action - New : The flash screen notification can now be used in every event. The time is not displayed in it anymore (but it is possible to see the timer screen once the screen has flashed). Action - New : It is now possible to change the background and the foreground color (for text or time widgets) of the timer screen as a new event action. Action - New : It is now possible to change the main and secondary display modes as a new event action. Display - New : Two new main display modes are available allowing to display the total or event progress as an animated pie. Display - New : When the screen is dimmed, touching the time label will temporary undim the screen, to see easily the time. Display - Change : Improved consistency when touching the main or secondary display in order to change their display mode. Display - Change : Unify the notifications of the events and the end notification in a similar screen. Messages - New : It is now possible to define a different message to be displayed in popups AND in top area for the events AND end notification. Messages - New : When you enter a new action message to be displayed you can now quickly select one of the 10 previously entered messages. Sounds - New : This main system volume, used for the internal sounds, can also be changed with a slider in the application. A button is added to stop all currently playing alerts. Sounds - New : Each played sound can have it's own audio gain defined independently (so you can use a same sound at different volume levels). Sounds - New : Specific option to pause the iPod music when a sound is played (to easily hear the sound). Sounds - Change : do not automatically stop the music player anymore when the stop button is pressed. Sounds-iPod - New : It is now possible to stop the iPod playback as a new event action. Sounds-iPod - Change : Use the device iPod player and not a special one so the played iPod music will continue playing when Timer is closed. Sounds-iPod - Change : Does not stop iPod anymore when another sound is played. Sounds-iPod - Change : Do not pause the iPod anymore when the pause button is pressed. Sounds - New : Some custom audio files can be used as alerts when the application is opened. Add as many audio files as you want. Sounds - New : Audio files can be added using iTunes File Sharing. 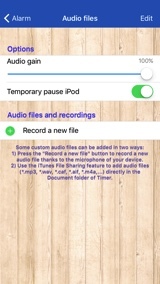 Add your files (*.mp3, *.wav, *.caf, *.aif, *.m4a,...) directly in the Document folder of the app, using iTunes, and you'll be able to use them in Timer. 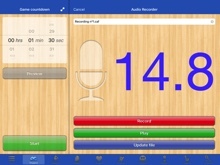 Sounds - New : Thanks to the microphone of the device, you can record your own files. Use your voice to remind you precisely the different things to do. Sounds - New : Those audio files are exported with the presets that uses them. 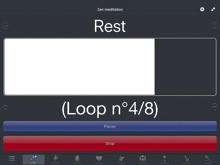 This way, you can easily share your routines with associated sounds in a single step. Theme - New : The look of the application can be changed thanks to a theme feature. 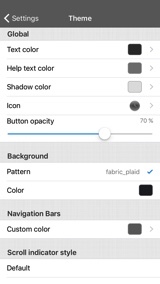 Theme - New : Various parameters can be customized like the background pattern or color, the text and shadow colors, the navigation bar tint color and more. Theme - New : The themes are persisted in the presets so you can give to your multiple presets a unique look for a better identification. 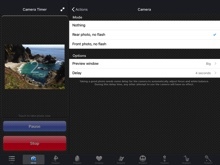 Camera - New : A new camera action is added and can be used on recent devices (>ios5). It can be scheduled like every other Timer action. Camera - New : Rear and front camera can be used. The flashlight (if available) can be set to on, off or automatic modes. Camera - New : When the picture is taken, a preview can be displayed on screen, in order to see how the picture will look like. Presets - New : Export your presets (and all their associated data, except iPod songs) as an email attachment for backup and share. 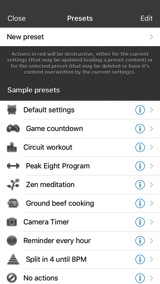 Presets - New : Import presets (created by you or by some friends) simply clicking on an exported presets file on your iOS device. New : The displayed time can now be related to the time between the events (and not the total time). 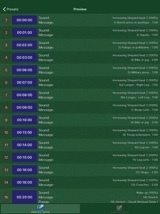 Very useful if you need to focus on each event duration. New : Allows to configure a smaller secondary display with various informations. New : A progress bar can be displayed as a secondary display types. New : A preview button is added in the Event and Events screens to quickly preview the changes. New : A clone button is added in the Event screen to clone the current event. New : Add restore button to the in-App purchase screen. Bug fix : Messages displayed by the events are correctly displayed after an application resume or a parameter change. Change : Improvement of the short message indicating the current display mode (when the main or secondary display is touched). New : Add the possibility to lock the screen in order to avoid hitting unintentionally the buttons (pause,stop ...). New : On iPad, add the possibility to show the time with big numbers in fullscreen (use the arrow button on the top to extent the time display). New : Displays a loop counter. New : Displays a short indication message (delayed or elapsed time) when the time is touched. Bug fix : Loop mode was sometimes omitted at the application launch. Change : Various information messages added or updated. New : The notifications can now be triggered when the application is in background, thanks to local notifications. 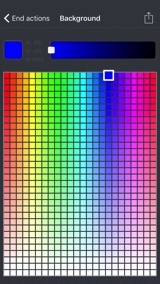 New : Graphical improvements for retina display. 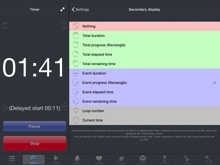 New : Delayed start feature, allowing to have a short preparation time before the timer is automatically started. New : Addition of a preview screen (for an easier understanding of the current settings, listing the time when the events will occur). New : The stop time can, optionally, be entered as an absolute hour value, instead of a relative duration. Use this feature to, for instance trigger 4 equidistant notifications until 6PM. 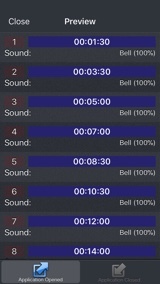 New : 15 alarm sounds added (mainly Zen ones). New : Optional mode allowing to trigger audio alarms as system alerts. 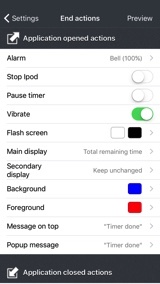 Using this mode, the iPod volume will decrease during an alarm playback and will increase back after that. New : Give the possibility to display the text messages of the internal events in popups (instead of displaying them on top of the time). New : Dark screen opacity can be adjusted. New : Switch displayed/remaining time display when clicking on the time label. New : When the Timer is started, take into account and event modification while editing it. Bug fix : The iPad playback is not decreased anymore after a vibration event. Bug fix : improved precision when the timer is looped. Bug fix : Various small bug fixes and improvements. Change : End popup changed to default one. Change : Do not trigger anymore end notification when returning to the timer app after the delay is elapsed. Change : Nicer about screen. Change : Cleaner splash screen. Upgrade : Favorites (Presets) available as in-app purchase : This feature lets you to load and save your settings, allowing you to have multiple configurations ready to be used. All the parameters of the application (including the special events) can be saved and restored easily. Each preset can be previewed to have a quick overview of its content. Give the name you want to your presets to organize them the way you want. 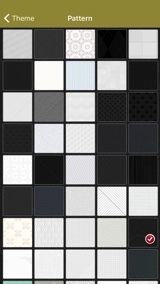 An unlimited number of presets can be stored. By getting this unique in-App purchase, you'll highly support this application development. Fixes a sporadic crash that appeared while changing some settings. Do not leave the application anymore when the About web view is displayed. Desactivate predefined events (tic tac noise, half-way mark alarm) in default configuration. Use the "Default Settings" bottom button to easily revert to those new default settings (this will also remove your own events). Events can still be activated manually, through the "Settings"->"Events" sub-menu. Textual descriptions for events (for a better understanding of what an event will do). Add short "Events" footer description in parameters screen (so users do not miss this powerful feature). Fixes the "avoid idle sleep" (renamed "avoid auto-lock") check ignored once an iPod alarm was played. Note: There is a side effect of using an iPod alarm : the inactivity delay of the auto-lock is reset when the alarm is played. Allows Music/Sound notification from your iPod library. 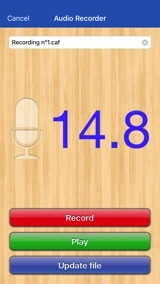 This way, a user can add custom sounds, or use a music as notification. Possibility to define multiple special events that will be triggered when the timer is running. This powerful feature replaces the simple tic tac sound. Sounds, vibrations (if supported) and messages can be notified at any time thanks to a complex time scheduling system. "Play a Gong sound 30 seconds before end"
"Every 10 seconds during 1 minute, produce a sound with an increasing pitch"
"Play a tic tac sound every seconds"
"Once One-half the time is elapsed, play an iPod song and show a custom message on the screen"
Timer Stop is now manual to allow ipod music playback until Cancel is pressed and to see the elapsed time even if the timer is done. Time displayed in red (with a +/- sign) when the timer is elapsed. Remaining (or current) time displayed with the flash screen notification. Full screen flashing text more visible on black background. 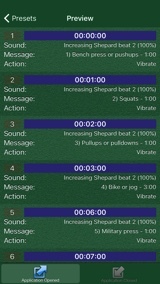 Tic Tac sound can be replaced by various other sounds including clicks and Shepard tones. Those Shepard tones creates the auditory illusion of a tone that continually ascends or descends in pitch. 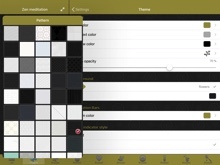 Portrait and Landscape visualisation modes are handled in all application screens. The time is displayed with a bigger font size (mainly with the new Landscape orientation). 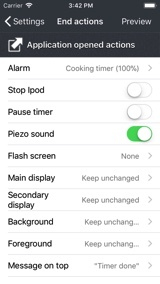 Using the System notification (vibrate/Piezo) should trigger a vibration on the iPhone and a Piezo audible alert on the iPod Touch. Screen can be dimmed during the timer execution. 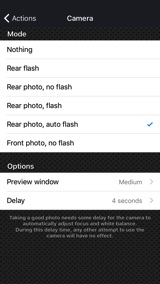 A new notification allows to make the screen flash (to use when silence is needed). 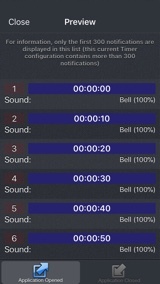 New short alarm sounds : Beep and Water Drop. Better organisation of the preferences screen.